A social rift between boomer and the millennial erupted in 2015. The verbal attacks came thick and fast — the boomer cast millennials as entitled, lazy and self-centred — knowing nothing of sacrifice. The millennials replied with accusations of greed and lacking sympathy and empathy. If I were a globalist banker wanting to create division with a divide and conquer mindset I wouldn’t change a thing. (iii) Create animosity and infighting between the two groups and siphon from the working class through debt and increasing income taxes (on the so called ‘1 percenters’) while taxing super at the other end of life. Both lose and will blame each other. In Australia, this is most pronounced in the Australian housing affordability crisis. Negative gearing, tax concessions, international demand and out of control private debt fueled skyrocketing house prices. The older generations stacked on the investments in bricks and mortar, forcing prices ever higher. This increase in prices resulted in millennials taking out massive loans. The millennials, now angered that they could not afford the Australian dream — whined to the government. Their cries are ignored, in return salt was now being poured into their wound. The boomers decrying that “$19 avocado on toast” was the reason for their lack of home ownership — minimizing all other economic factors. Anger directed towards both demographical groups looks superficially reasonable. But is there another reason for creating this division? Boomers have amassed vast fortunes in the form of superannuation, housing and stocks. Their amassed supposed earned and un-earned fortunes now to be spent in their golden years. While we were at each other’s throats, bankers, property developers, hedge funds and overseas investment firms have been scheming to get their hands on that piggy bank. The locked-up wealth represents trillions of invested dollars. Any legalized theft taxation of superannuation needs public support. 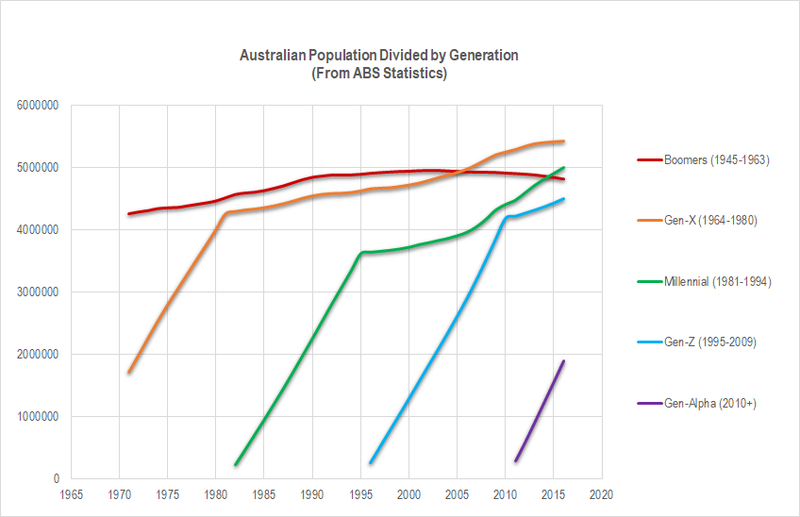 Boomers have been the largest generation to have lived in Australia up until 2005 — with greater numbers, political voting dominance was theirs. Within this decade, millennials will most likely overtake Gen-Xers, having already overtaken the boomers in 2013. In fact, those wanting to raid the boomers would encourage boomers to lock up as much wealth in investment homes and superannuation — this would make the haul bigger. To complete this plan, discord must be made to legislate a legalized wealth transfer; demonize boomers starting with a generational smear of the millenial — “Avocado on toast”…”back in my day 18% interest rates”…”I didn’t go to university”…”You are all whining snowflakes”…”We did it tough, we didn’t have $1000 smart phones”…”We never went on yearly vacations” — “You have negative gearing, we have got zip.”…”You didn’t have to compete with automation”…”Old people aren’t retiring, so we don’t have jobs”…”We have to pay off our HECs debt, while you did not” etc… All are partially valid and equally refutable. Governments respond by introducing super taxes, a land tax or more rigorous pension asset tests unimpeded without losing their voting support base. In the past, angry boomers felled governments — but not now. It is my thought that millennials will be seething with anger after being laden with both a large public and private housing debt. They will vote for this transfer and believe that this money will be rightfully theirs. The government will ‘oblige’. So who would benefit? The bankers to whom all this debt is owed and the government that taxes to pay off their debt. It is already starting with Shorten wanting to axe cash refunds for excess imputation credits — the call for taxes will only worsen with time. Take note of Turnbull attempting to appear Boomer friendly rather than appeal to Gen-X or millennials — it will only worsen his polling with the Australian public. This generational warfare is not going to end well for anyone. Unfortunately, I believe we are too far along to mend the natural relationships between young and old on a national level. I am also guilty of mindlessly participated in this generational warfare, but not now. We need to start protecting our relationships that we already have; realizing we are both being played off against each other. Politically it will become increasingly popular to introduce further taxation on superannuation and housing to pay off national debts. In time, political parties will have no choice but to go along with the angry masses. The boomer super trough will be raided by future governments — reneging on their ‘ancient’ promises of no taxation. Millennials will be tricked into buying at the peak of the cycle, when interest rates are at their lowest, only to find them rising in a short number of years to be paying off a proportion of their income equivalent of what boomers were in the late 80’s. Boomers were suckered into a market in the 80 real estate crash as well — looks like we are no different. The Boomer will have to contend with a government that will be increasingly hostile towards them — land taxes introduced — negative gearing removed — more stringent pension asset tests — reduction in health care benefits and increased health care costs. The millennial will not feel sorry as the boomer nest egg gets raided. Rather, they will feel rightfully vindicated. Will not the numbers of Gen X and Millennials that are going to inherit this wealth not stand up in rage alongside their parents? Though there is no shortage of complacent fools happy to cheer on the theft to keep their girlfriends happy.